Washington, D.C. (January 4, 2018) –– Four teachers with diverse styles and subjects have been selected as finalists for the 2018 National Teacher of the Year. One is an American Sign Language teacher who takes her students beyond the classroom and reinforces that every voice has value. One is an elementary educator who uses project-based learning in her STEM curriculum to cultivate curiosity in her students. Another is an elementary art teacher who used a community painting project to demonstrate the power of the visual arts to engage, communicate, and bring people together. Another nominee is often the first teacher who the refugee and immigrant students in her classroom have once they arrive in the U.S. She uses experiential projects to help her students process trauma and learn about their new community. 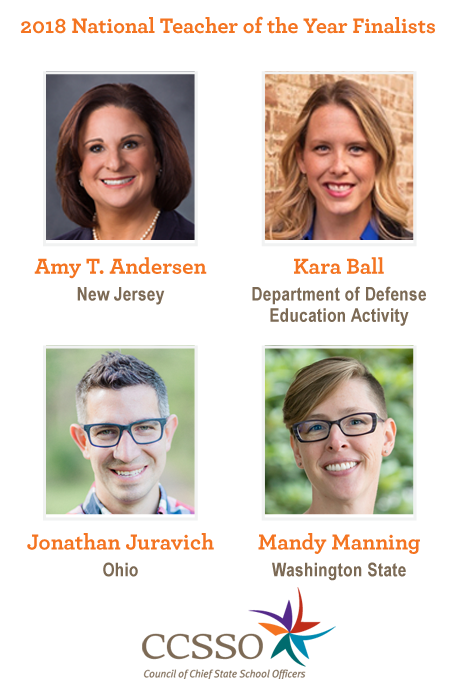 One of these finalists will be named the 2018 National Teacher of the Year (NTOY) this spring, and will spend the next year traveling the country to represent educators and advocate on behalf of teachers and students. Every year, exemplary teachers from each state, the U.S. extra-state territories, the District of Columbia, and the Department of Defense Education Activity are selected as State Teachers of the Year. From that group, a national selection committee representing 14 renowned education and community organizations, which collectively represent millions of educators, selects four finalists for National Teacher of the Year. The National Teacher of the Year is then selected from the four finalists after rigorous in-person interviews with the selection committee. Each year, since 1952, the President of the United States has recognized the National Teacher of the Year in a White House ceremony in the spring. Amy T. Andersen believes that a nurturing classroom fosters academic achievement. Amy started her career in Boston as a teacher of the deaf for eight years and she promoted strength in diversity. She celebrated students' differences by organizing field trips to various schools in Boston where her students presented to hearing children about American Sign Language (ASL) and deaf culture. In 2004, Amy moved to New Jersey and began the American Sign Language program at Ocean City High School with 42 hearing students. Enrollment jumped to 138 students and today, she teaches ASL 1, ASL 2 and ASL 3 Honors. In 2015, her program was highlighted on an Emmy-award winning program when her students’ ASL anti-bullying video went viral. Amy, a National Board Certified Teacher, takes students beyond the classroom by arranging paint nights with world-renowned deaf artists and signing opportunities with the National Association of the Deaf. She reinforces that every voice has value and it's our human right to communicate. Amy shows her students that diversity enriches all of our lives, and Ocean City is now known throughout the deaf community as a "deaf-friendly" town in South Jersey. Her students discover that differences should be celebrated, which leads many of Amy's students to careers in deaf education or ASL interpreting. Her students have even interpreted for former First Lady Michelle Obama and Madonna. To read Amy’s National Teacher of the Year Application, click here. As a cultivator of curiosity, Kara Ball uses science, technology, engineering, and mathematics (STEM) education and project-based learning to transform her elementary students into the leaders of tomorrow. Each year Kara brings sharks into her classroom and her students conduct a shark dissection. She also organizes a school wide Cardboard Arcade where students use the engineering design process (EDP) to work in teams to imagine the possibilities of a single cardboard box. Currently teaching military-connected students at Camp Lejeune for the Department of Defense Education Activity (DoDEA), Kara has also taught multi-age, special education, STEM, and advanced mathematics. She also has experience teaching in communities with large homeless and English as a Second Language (ESL) populations. Kara is a National Board Certified Teacher who has served as a Mentor Teacher for eight years, District STEM coordinator, and U.S Naval Academy SET Sail STEM Team Leader. She is a member of DoDEA’s Strategic Planning Committee and her school’s Continuous School Improvement Team. In 2013 she was the recipient of the Shirley J. Lowrie Award from Montgomery County Public Schools, Md., honoring an exemplary elementary education teacher. In 2016, she was DoDEA’s finalist for the Presidential Awards for Excellence in Mathematics and Science Teaching (PAEMST). To read Kara’s National Teacher of the Year Application, click here. Taking advantage of seemingly small moments to make a big impact for others is the cornerstone of Jonathan Juravich’s professional and personal conviction. Jonathan is an award winning artist and art educator at Liberty Tree Elementary in Powell, Ohio. In his 13th year in the classroom, Jonathan, known as Mr. J, challenges students to make the world a better place through art. In his work as an artist, coach, and educational leader, he hopes to do the same. Jonathan is the Building Environment Team leader at Liberty Tree - overseeing school culture, partnerships, and service learning. As the district Elementary Visual Art Department Chair, he facilitates professional development, advances curriculum, and advocates for arts education best practices. Coaching middle school cross-country and track gives him opportunities to continue making connections with students and families well after they have left his classroom. Jonathan reaches out to the community locally and statewide by developing art programs with the Columbus Zoo, the Columbus Arts Festival, the Ohio Association for the Developmentally Disabled and the Ohio Art Education Association. He mentors future art educators as an adjunct instructor at Otterbein University, his alma mater. To read Jonathan’s National Teacher of the Year Application, click here. Mandy Manning teaches English and math to refugee and immigrant students in the Newcomer Center at Ferris High School in Spokane, Washington, where she is her students' first teacher once they arrive in the U.S.
Mandy began her career as a teacher in the Peace Corps in Armenia. She has also taught in Japan and in schools across the U.S. This global perspective infuses her classroom. Mandy uses experiential projects like map-making to help her students process trauma, celebrate their home countries and culture, and learn about their new community. Mandy has hosted more than 160 teaching candidates in the Newcomer Center. Many teach their first lesson in the Center. For others, the Center is their intercultural field experience. Mandy aims to expose as many future teachers, colleagues, and community members as possible to the diverse environment of the Center. District leaders, school board members, and legislators are regular visitors to her classroom. As a National Board Certified Teacher, Mandy is an ambassador and mentor to her colleagues and is known for her collaborative style and determination to bring marginalized voices into decision-making. Mandy lead a diverse committee in re-evaluating her school’s discipline plan and adopting an evidence-based behavioral intervention plan that enhanced academic and social behavior outcomes for all students. This effort resulted in a 74 percent decrease in suspensions in the first year. To read Mandy’s National Teacher of the Year Application, click here.